My server got a Dell PERC H330 raid card, and I made it’s working in HBA mode to make sure that it can get best performance under FreeBSD with zfs. But every time when I boot the server, I’ll get below error message and it take a long time to pass the disk check stage. After research, it seems this timeout error was caused by the old mfi driver. 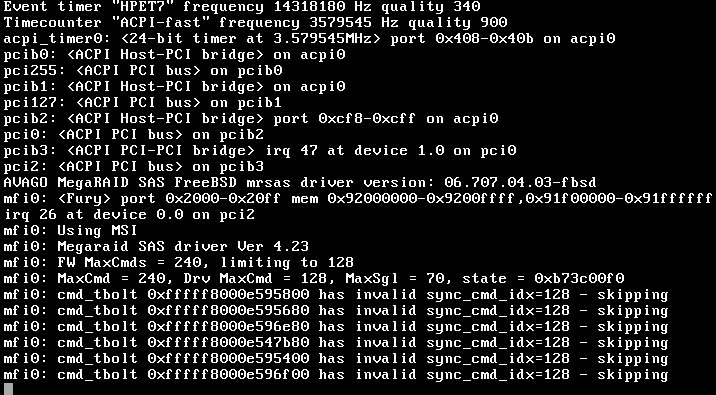 And LSI has released a new mrsas driver for FreeBSD. So It’s better to switch the driver from mfi to mrsas. And then add below device hint into /boot/device.hints . This line is very important. Without this device hint, FreeBSD will use the old mfi driver for raid card even though you enabled maras drvier. And then, add below line into /boot/loader.conf to disable disk id identity. And don’t forget to update /etc/fstab to change the swap partition from mfi*p* to da*p*. Otherwise you’ll lose your swap partition. Then, reboot your server, and enjoy. This entry was posted in FreeBSD and tagged disk, FreeBSD.DELL.PERC, LSI, mfi, mrsas, RAID, zfs on May 15, 2016 by Sean.